Others carried pictures of migrants who were deported from Israel and later reportedly died while trying to reach Europe. A counter-protest of about fifty far-right activists who support the current government plan to deport asylum-seekers from Israel to an African country also took place. Less than a week after the Population and Immigration Border Authority issued 20,000 deportation notices to Eritrean and Sudanese seeking asylum in Israel, a group of rabbis announced the formation of a national absorption project. Rabbi Susan Silverman, co-founder of Miklat Israel (Israel Sanctuary), said thousands of Israeli families, including many living in kibbutzim, are willing to open their homes to asylum-seekers who face the choice of deportation or prison on April 1. “We had no idea how big it would become so fast,” Silverman said on Thursday to the Jerusalem Post. “That was a surprise to all of us.” According to co-founder Rabbi Tati Schagas, 2,600 families have expressed strong interest in the initiative. 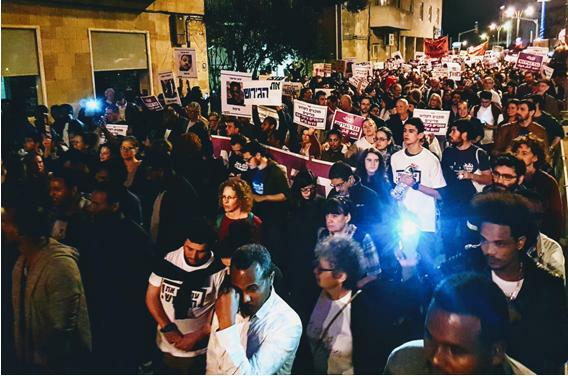 “What we are trying to do is disperse them throughout the country so that the pressure presently in south Tel Aviv is no longer an issue, and we’re trying to give them places where they will be able to work and become part of communities that are ready to support them,” Schagas said. In conjunction with Israel Sanctuary, Silverman said she is in the developmental stage of creating Start-Up Nation University for Refugees to educate absorbed asylum-seekers.